LINDEN, NJ--(Marketwired - Feb 19, 2014) - Luxury home textiles company, Luxor Linens, is pleased to announce the expansion of their e-commerce boutique, offering the widest selection of Egyptian cotton sheets, towels, bathrobes and other home textiles all customizeable for delivery to your door, with just the click of a mouse. With more than one-third of our lives spent in bed, it's no wonder a good night's sleep can make all the difference in overall happiness, that's why the experts at Luxor Linens, have taken every precaution to ensure that creating your at-home sanctuary doesn't turn into a nightmare. 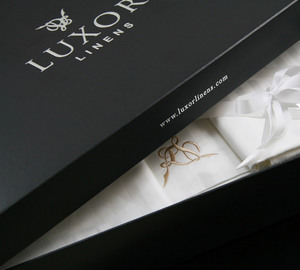 Luxor Linens strives to create a truly personalized experience while shopping online from the second you open their website to the moment your personalized package arrives at your door. Within minutes of ordering, your items are prepared in their newely expanded Linden, N.J. workshop, complete with optional monogramming and luxe gift packaging, ensuring when you receive your order you feel nothing short of royalty. Best known for their Egyptian cotton offerings, Luxor Linens' website boasts an impressive collection of the world's finest textiles (including silks, bamboo and eiderdown) for all of your household needs at unbeatable prices. Luxor Linens makes sure to not leave out our favorite members of the family -- the children and pets! Luxor's offering of children's towels, shower curtains, as well as pet bedding means this site can easily act as a one-stop-shop for any growing family. Additional customized monogramming is easily available starting from $24.95 on all Luxor Linens orders. Luxor Linens is the leading provider of luxury textiles to the finest hotels and homes worldwide. Founded in 2005 by Mike Nusinkis and Jack Nekhala, Luxor exhibits an exclusive collection of world-class luxurious bed & bath linens made of the highest quality Egyptian cotton. Luxor Linens is renowned for its unparalleled customer care, and to ensure clients the most accommodating service, Luxor Linens also specializes in customization of linens including everything from monogramming to irregular sizing tailored-to-order. For more information, please visit http://luxorlinens.com.